Research Highlights in Technology and Teacher Education 2018 . Publisher: Association for the Advancement of Computing in Education (AACE). knowledge about information technology in teacher education. The distinguished research articles included here illustrate how teacher educators, researchers and practitioners are collaboratively addressing the use of technology in teacher education as they explore contemporary, creative and innovative solutions to integrate technology across the world. 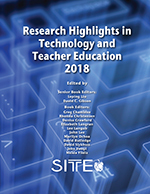 Liu, L. & Gibson, D. Research Highlights in Technology and Teacher Education 2018 . Association for the Advancement of Computing in Education (AACE). Retrieved April 24, 2019 from https://www.learntechlib.org/primary/p/207261/.